Food Systems is a growing career path for people who don’t mind getting their hands dirty and working to lighten agriculture’s impact on the land. There is a growing awareness that the current system of agriculture and food production is broken. Students following the Food Systems and Land Management career path are devoted to developing alternative means of growing, distributing, and purchasing food. They use their knowledge of biology, finance, and management to develop new food systems and methods of growing and raising food. The Food Systems career path includes the manual labor that is required in the organic vegetable and intensively managed rotational grazing methods of agriculture, but it is much more than that. It includes people that organize and manage urban agriculture programs that combat the nation’s food deserts. It includes the management and coordination of local and organic food distribution organizations and businesses. It can even include the management of alternative food retail centers such as community-based cooperatives and farmers’ markets. The Food Systems career path can include a wide variety of occupations and working environments. Many of the opportunities in the Food Systems career path involve heavy use of management and finance skills. Whatever the degree, it is important not to overlook these areas when going into the Food Systems career path. For those looking to work more on the production end of things, a rich understanding of ecology, botany, and animal science is important. Students considering a career in Food Systems should consult with faculty to develop a course of study that is appropriate for their areas of interest. Ryan Jepsen (‘99) graduated from Luther with a degree in Biology, though he is now pursuing a career in Environmental Studies. 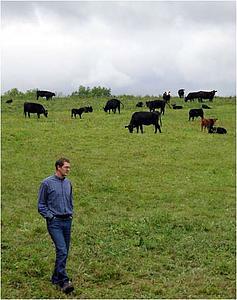 He is a founding owner and heads the sales and procurement division of Grass Run Farm, a Decorah area local-meats company. In this capacity, he buys grass-fed beef, all-natural grain-fed beef, and all-natural non-confinement pork from local livestock producers, then arranges the sale of that meat to cooperative grocery stores, restaurants, and institutions (including Luther) across the Upper Midwest. Ryan also arranges processing at USDA-inspected craft-processing facilities and maintains relationships with dozens of customers and vendors throughout the local foods industry.